Etching by Jacques Androuet du Cerceau, 16 x 23 (Jessen). Herbet, IV, 1900, 302 (1969, 152), V (Grands Cartouches, Second Set), 4. COLLECTIONS: Florence, 12777 st. in vol. (15.5 x 22.8 S). New York, 62.525, no. 41. Geymüller, 1887, 56, 173, Fig. 86, 192. Jessen, 1920, 64, Fig. 45. Béguin and Pressouyre, 1972, 132. 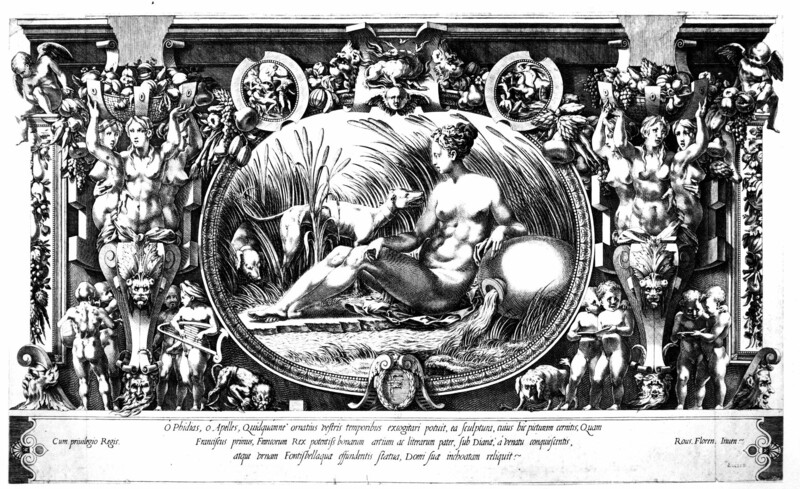 This etching, which is related to the frame of the Danaë in the Gallery of Francis I, is largely and freely derived from Fantuzzi’s etching, without the view of a town on the sea in the center (Fig.E.69), and with the F below eliminated and the small circular scene above replaced by a flaming salamander. But the inclusion of the salamander and the height of the volutes above the baskets at the sides suggest that Du Cerceau also knew the Milan-Boyvin engraving (Fig.E.103). Du Cerceau shows the dogs, which do not appear in the gallery, as shaggy. The drapery around the hips of the women that appears in the Milan-Boyvin print is not found in Fantuzzi’s and Du Cerceau’s etchings. The panel at the far right has decoration as in the gallery and in the engraving, but different from both in its design. 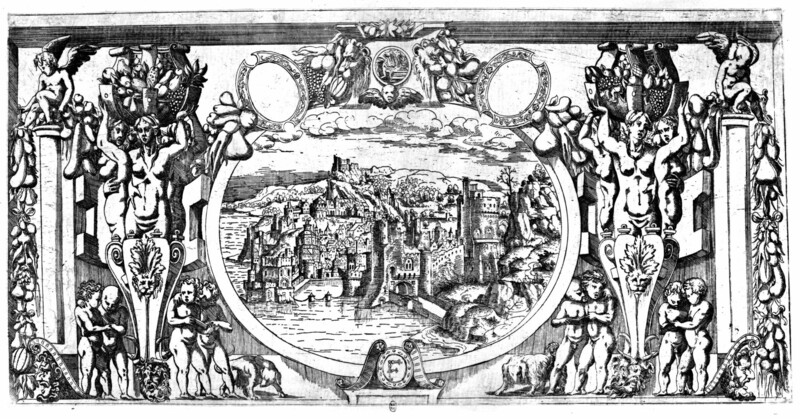 DERIVATION, PRINT: Title page of Ariosto’s Roland Furieux, Lyons, 1544. LITERATURE: McAllister Johnson, 1965, 299, n. 3, the flanking figures derived from the stuccoes of the Danaë wall in the Gallery of Francis I. McAllister Johnson and Graham, 1968, 9. Zerner, 1972, 115, 118, Fig. 179, as derived from the prints made of the decorations in the Gallery of Francis I. Details of the triads of female terms of this title page indicate that they were derived from Du Cerceau’s etching. To be noted are the full view of the tilted heads of the outermost figures and the particular drawing of the hand touching the torso of the central figure of each group.